I was recently asked to recommend the best Mexican restaurants in the Los Angeles area. I thought that sending a link to this website would provide a definitive answer, but I made special mention of La Casita Mexicana, a favorite for several years. In fact just thinking about it prompted me to jump in the car with my friend Leili for another visit. I had the Chamorros de Res, a wonderful braised beef shank in a spicy adobo sauce, and Leili had the spectacular Chile en Nogada – a first-time treat for her. 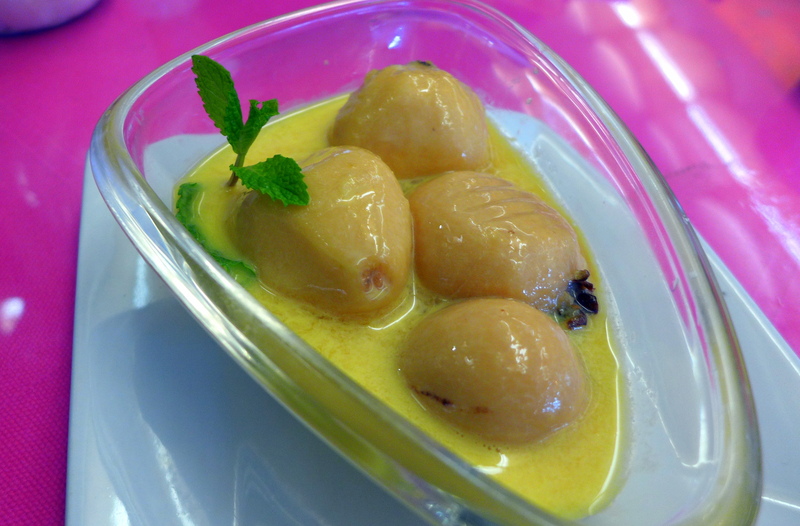 I’ve written about the Chile en Nogada previously, and the Chamorros de Res deserve a whole discussion on their own, but what I want to tell you about today are the desserts. How do you improve on the comfortable familiarity of rice pudding? 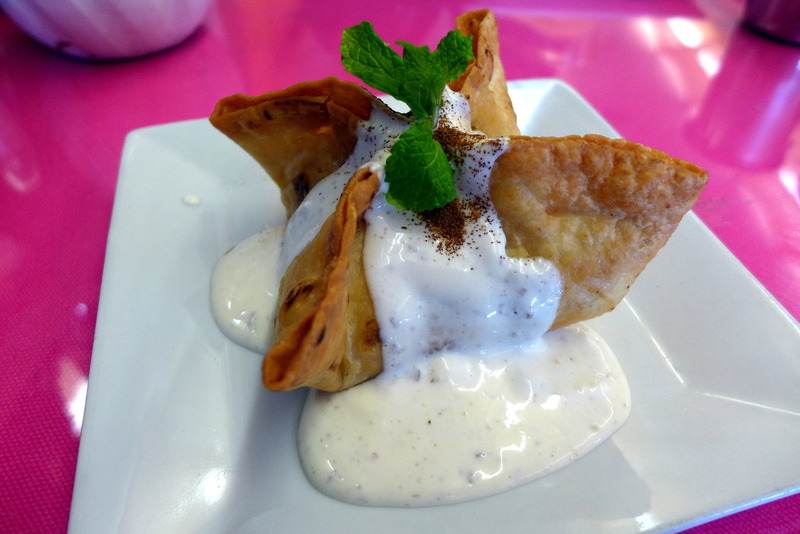 Well, you wrap it in a rich deep-fried batter, and smother it in an almond cream that adds richness and nuance that my mother could never have imagined when she served me rice pudding while I was growing up. This was both familiar and exciting at the same time. We also tried something entirely different. Guavas in Rompope. Guavas rank right next to passionfruit as one of my favorite flavors, and there are guava pastries around Los Angeles that I am willing to drive miles for, when I’m in the mood. What was really interesting this time was serving the guavas in Rompope, which is typically referred to as Mexican eggnog, but that doesn’t quite cover it. I have only known Rompope as a flavoring for ice cream and cakes, and yes, it is kind of a wild and crazy eggnog flavor. But Rompope is really a liqueur from the Puebla region, made from eggs, milk, vanilla and I’m guessing, rum. The combination with the guavas was a taste thrill. 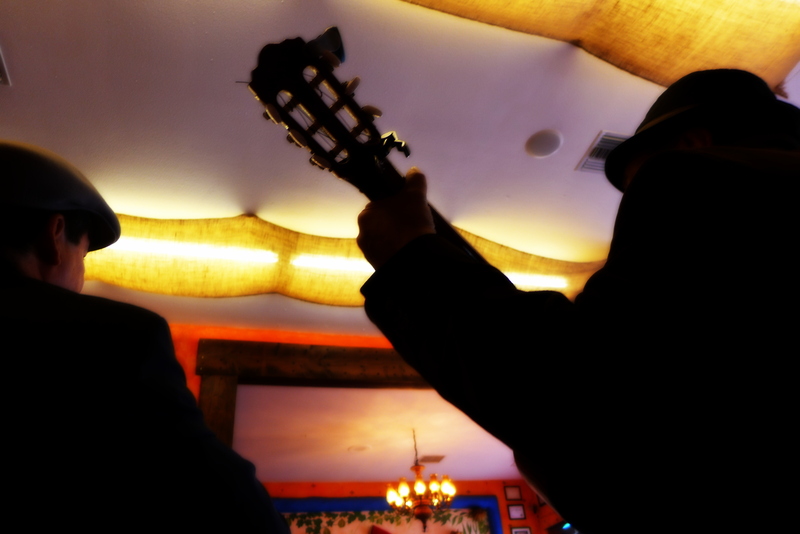 It was Sunday afternoon east of downtown, so of course, we were treated to Mariachis. It was a fun afternoon. 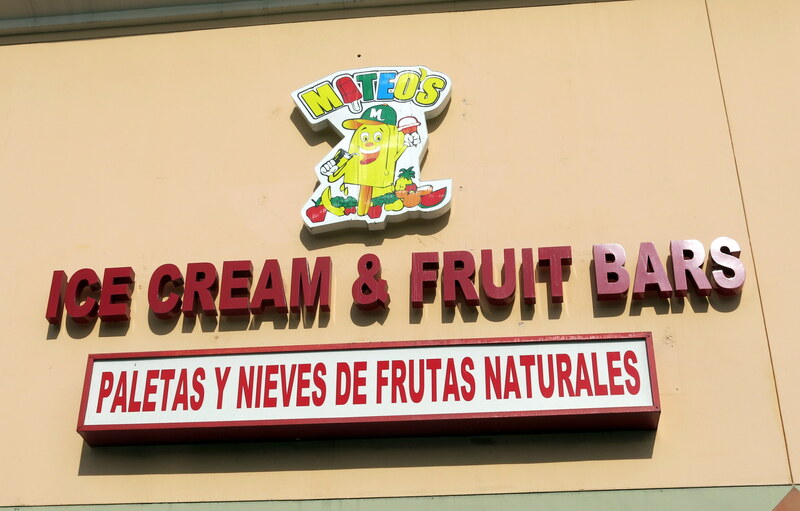 Whenever I’m in the Pico Union neighborhood of Los Angeles, I try to make a stop at Mateo’s. 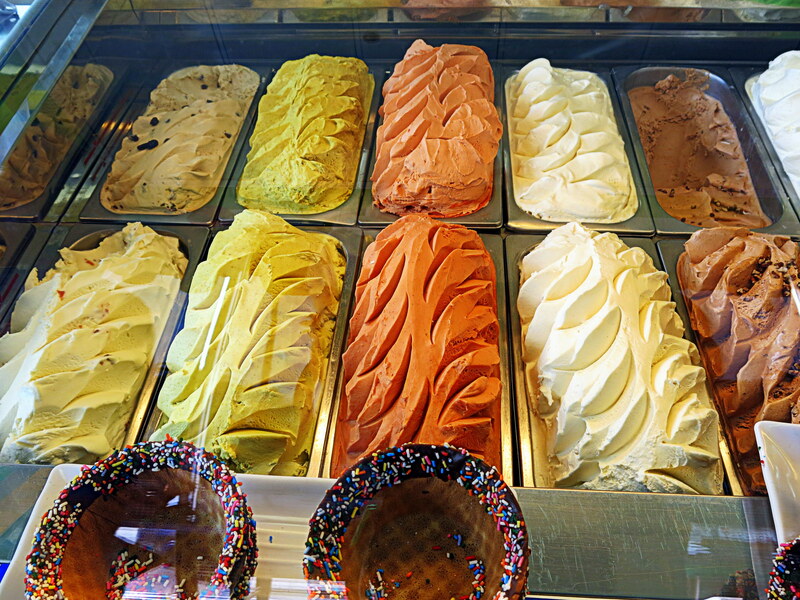 It’s a colorful, friendly place that makes me feel happy the moment I walk in, and they have the most interesting assortment of ice cream flavors I’ve ever seen. There are all sorts of exotic flavors I’ve only encountered in Mexico, including Mamey, Passion Fruit (called Granadilla here), Guayaba, Guanabana, etc. I recently tried the Mezcal flavor, something I expected to be a weird novelty, but was delighted with the flavor. 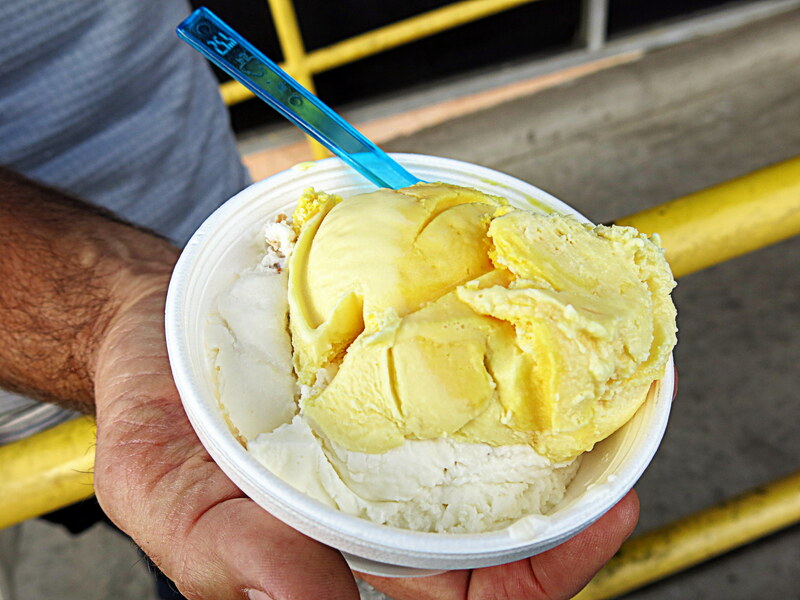 I was feeling adventurous, so I tried it with a scoop of Rompope flavor, the Mexican version of eggnog. Again, I thought it was going to be a bizarre combination, but the flavors blended perfectly. 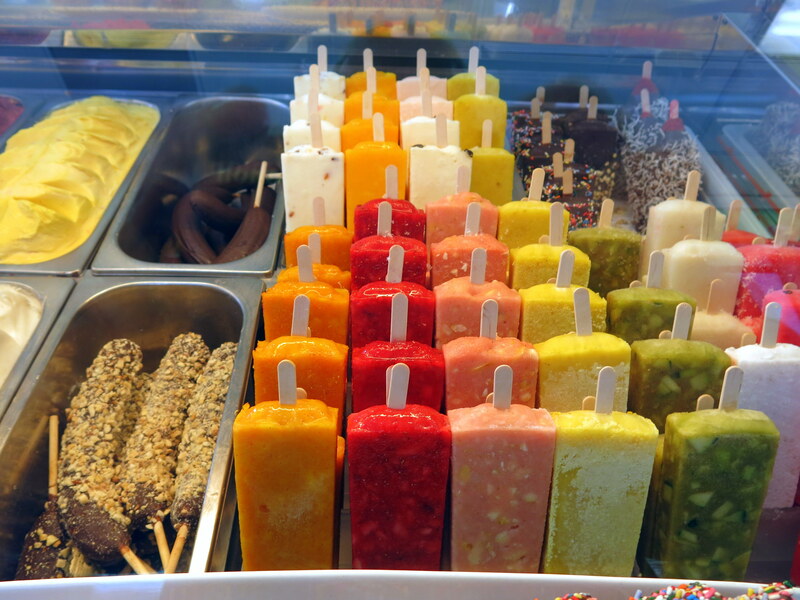 I’m reluctant to admit that I’ve been so involved with trying all the ice cream flavors that I have never tasted the beautiful selection of paletas, or popsicles. The good news is that I find myself in the area regularly, and will certainly get around to them. They have various locations, but this one is at 1250 South Vermont, in a shopping center at the corner of Pico.